For flash point determination of fuels, lubricating oils, liquids containing suspended solids and liquids that tend to form a surface film during testing. Determines flash points of a wide range of products by a closed cup method with two option speed stirring of the sample. Extensively used in shipping and safety regulations for detection of contamination by volatile and flammable materials in fuel oils and lubricating oils, and for characterization of hazardous waste samples. 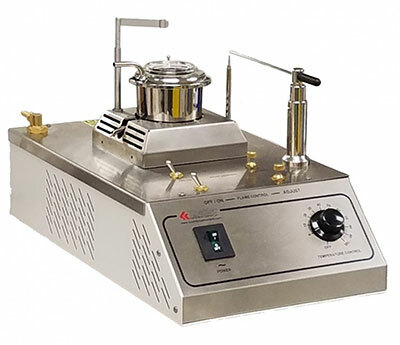 Gas heated model has a built-in nickel plated brass natural gas burner, or can be supplied with an artificial gas burner or liquid propane burner. Both models are mounted on a sturdy cast iron base. Slow speed gear motor with twin pulley rotates stirrer of Pensky-Martens Closed Cup Flash Tester at 115 RPM for the basic procedure or at 250 RPM for suspensions of solids and highly viscous samples. Chuck accepts flexible stirrer shaft of flash tester. Includes adjustable support bracket and mounting rod with threaded end for easy installation in base of K16203/K16273 or K16000 flash tester, and three-conductor line cord and plug. FP-K16273 Pensky-Martens Closed Cup Flash Tester Electrically Heated 220-240V, 50/60 Hz P.O.R. Order Stirrer motor and thermometers separately. Stirrer motor is required to conform to specifications listed. FP-K16040 Natural Gas Burner; nickel plated brass P.O.R. All models require a gas regulator and an external source of flame ie: propane/butane bottle or bbq tank (not supplied), as per the ASTM methods. For flash and fire points of all petroleum products, except fuel oils and those having an open cup flash below 79°C (175°F). For flash points above 79°C (175°F)Determines flash and fire points by the Cleveland Open- Cup method. 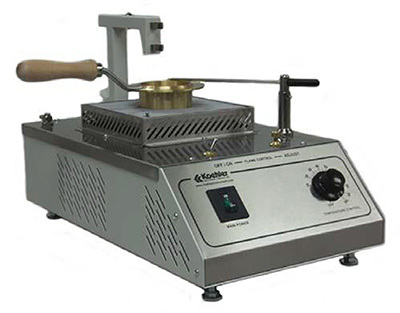 Consists of test flame applicator, brass test cup, thermometer support, heating plate and electric heater. Applicator is precisely aligned per specifications and pivots for test flame application at specified temperature intervals. Hinged thermometer support raises to facilitate placement and removal of test cup. Adjust flame size using built-in needle valve and comparison bead. Equipped with a 1000W nickel-chromium heater with stepless variable heat control for accurate repeat setting of temperature rate of rise per specifications. Shipping Dimensions: 2 Cu. ft.
FP-K13992 Cleveland Open Flash Tester, Electrically Heated 220-240V 50/60 Hz P.O.R. For flash point determinations of liquids with a viscosity of below 5.5 centistokes (cSt) at 104°F (40°C) or below 9.5cSt at 77°F (25°C), and a flash point below 200°F (93°C) except cut-back asphalts, those liquids which tend to form a surface film under test conditions and materials which contain suspended solids. Determines flash points of liquid products by the Tag Closed Cup method. Features stepless variable heat control with reference dial for accurate repeat setting of temperature rate of rise per specifications. Also available with gas burner instead of electric heater. Precision machined cover mechanism simultaneously opens slide shutter and applies test flame to sample at the turn of a knob. 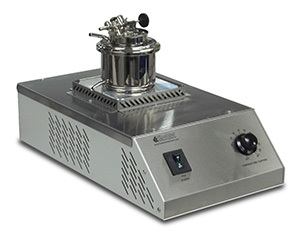 Includes liquid bath with constant level overflow, brass test cup, plated brass thermometer ferrules and test flame reference bead. Bath and cover mechanism are constructed of plated brass. Heater is enclosed in a cast aluminum base assembly. Includes heater unit with electric heater or gas burner. FP-K14671 Tag Closed Cup Flash Tester, Electrically Heated, 220-240V 50/60 Hz P.O.R. For liquid products, including non-petroleum products, having flash and fire points of up to 325°F (163°C). Suitable for cutback asphalts having flash points of less than 200°F (93°C). 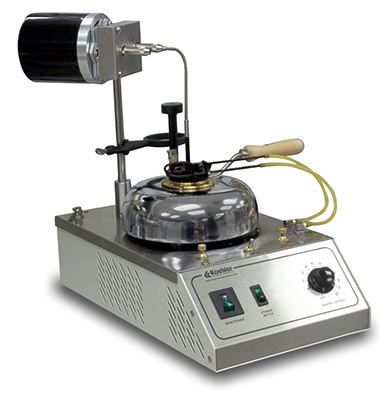 Includes Pyrex™ sample cup, plated brass liquid bath with constant level overflow, pivoting ignition taper with pilot light and reference bead, pivoting thermometer holder, heater and cast aluminum base. Electrically heated model is equipped with a stepless variable transformer for accurate control of temperature rate of rise per specifications. Also available with gas or alcohol burner. Includes heater unit with electric heater or gas or alcohol burner. Order thermometers, leveling device and draft shield separately. All models require (2) two thermometers. FP-K15671 Tag Open Cup Flash Tester, Electrically Heated 220-240V 50/60 P.O.R.